It looks like you can click above. But you can't. Let’s talk about the weather. People love it. And they hate it. It’s probably the number one trending topic of life from now until the end of time. Most of us can just go with the flow – one day is sunny, the next is rainy. Big deal, right? Well to those of us who put on outdoor events now and again, it IS a big deal. There are 30 instances every year where I have to closely watch the weather and many times make a decision on what to do if it looks bad – too hot, too cold, too wet, too dangerous. Concerts, festivals, film screenings, pillow fights – all outdoors. And of course I’m not alone. There are hundreds of us here who fret over our forecasts for days, knowing that if the weather’s not right, our events could fail miserably or be cancelled all together. To keep it in perspective – catastrophic weather events happen around the world every day, causing much bigger problems than a cancelled community event. But until we have another storm like 1980, we all have a right to complain a little bit now and then. We had a good shot of rain last month on both nights of the Kickball Classic, a scenario that cost us quite a bit of money. And Chalkfest has had to deal with some moisture as well, not to mention several cancelled Thursay night concerts over the years. When it comes to these sorts of happenings, the weather isn’t just weather – it can be economic stimulus or an economic suppressant. It can affect the moods of thousands. 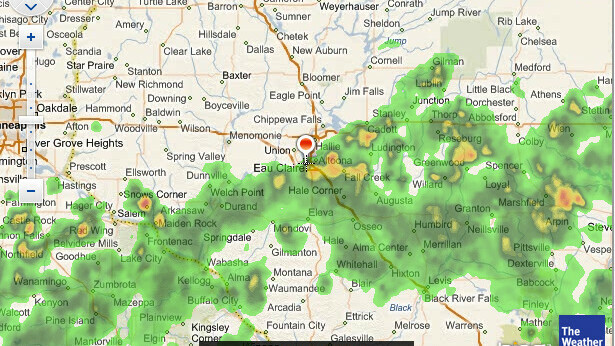 And it can make me obsessively refresh the page at weather.com to see if the forecast has improved.